The streets of Dublin are not only populated by musicians, but also of street performers and mime artists. Certainly, no one can say there’s a lack of entertainers in the city. Come weekend, there can easily be an act every 50-60m down Grafton Street. For some reason, the junction where Grafton Street meets St Stephen’s Green often has fire-related action going on. Usually, this is the spot of a couple of guys dancing to Jamaican tunes and doing fire limbo in some funny leopard prints – one of them would even limbo as low as the height of a beer bottle. 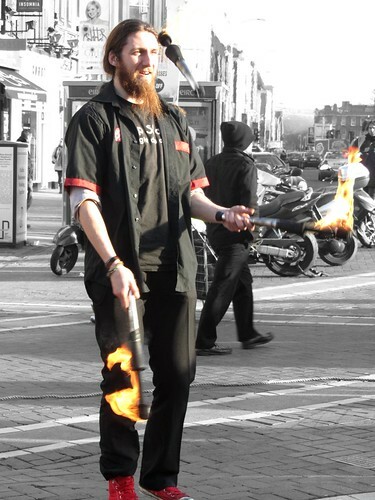 Today though, it’s a jongleur that plays with fire. He’s not bad in getting the crowd going, but I didn’t have time to assess the show in entirety since I was heading to an appointment.